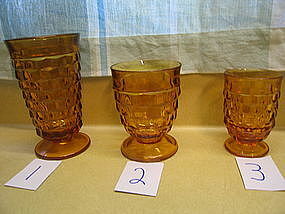 The photograph shows 3 sizes of the pattern and the listing is for #1, which is a 6 inch footed tumbler. It holds 16 ounces. There is no damage. I have several of the 6 inch available, as well as other sizes. I need your zip code to calculate the postage. 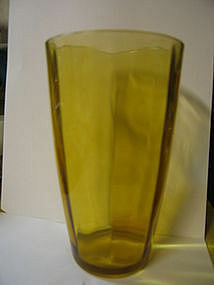 Vintage cubist glass, shown in the photo, as #3. It is 3 7/8 inches in height. There is no damage. 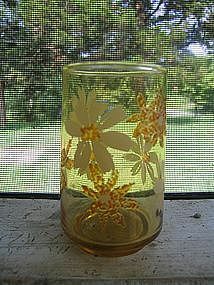 Several of this size, as well as the other size shown in the listing photo, are available. I need your zip code to calculate the postage. These are heavy duty custard cups. 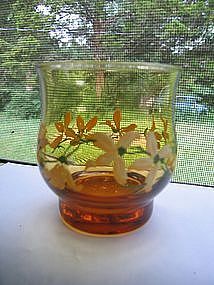 They blend well with the Pyrex amber and Corning Visions. They are not manufacturer marked. I can't get a photo to show the details on the bottom. It says "custard cup 6 ounces 177 ml USA 1034 10. They have little if any usage wear. If you have any questions regarding this listing, please email. 6 are available and priced individually. I need your zip code to calculate the postage. 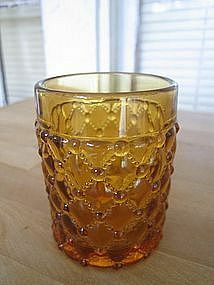 Vintage 3 3/4 inch juice glass. I do not know the manufacturer. Some of the daises are highlighted with a resin/plastic material. A few light utensil marks. Approximately 8" in height and 8" in width. It is not marked, but could possibly be L.E. Smith in the trellis pattern. Manufacturing flaws and one area that I am not sure if is. Please email for photo the area. I need your zip code to calculate the postage. 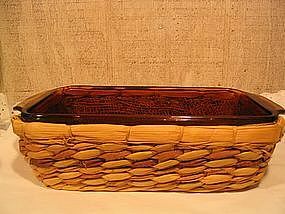 1 quart loaf pan with the original wicker serving basket. No chips, cracks, breaks or roughness. Very little sign of use. I need your zip code to calculate the postage. 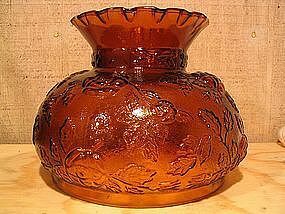 Vintage amber bottle and stopper. It is 22 inches in height. There is no damage other than one tiny flake/chip on the interior rim of the bottle. I have a close-up photograph of the raised pattern. There are 2 bottles available and priced individually. I need your zip code to calculate the postage. 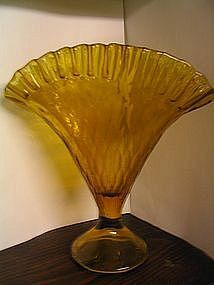 Unmarked, but looks very much like Libbey glass. 5 3/4 inches in height. The flowers are on all sides. No chips, cracks or breaks. Little if any loss to the design. I need your zip code to calculate the postage. 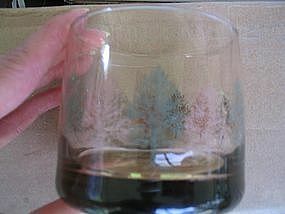 I always thought this glass was manufactured by Libbey, but just realized, they are unmarked. It is a deeper amber than the photos are showing, but had to lighten a bit to show the design. The base is very thick. It is an 8+ ounce size. No chips, cracks, breaks or roughness on the rim, but has a couple of faint usage marks, but none that is on the design. Additional photos or info by email. 4 glasses are available and priced individually. I need your zip code to calculate the postage. It is quite heavy with a thick base. It is 3 1/2" in height and 2 1/2" in width. There are no chips, cracks or breaks. I need your zip code to calculate the postage. Globe made to fit the "Gone with the Wind" style lamp. It is 6 1/2 inches across (measured from the inside of the bottom rim. It is 6 inches in height. No chips, cracks or breaks, but has slight roughness on the bottom rim. I need your zip code to calculate the postage. 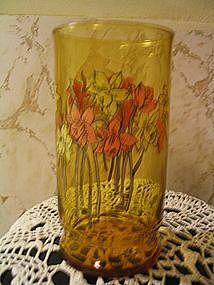 Vintage 8 panel tumbler measuring 6 1/2 inches in height. It holds 22 ounces. There are no chips, cracks, breaks or rough rim. Very little sign of use. I will be happy to provide additional identifying photographs. I need your zip code to calculate the postage. 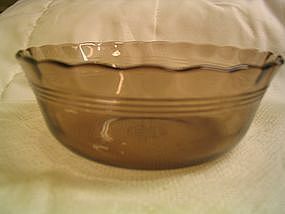 Vintage Pyrex 209 pie pan measuring 9 inches in width. There are no chips, cracks, breaks or rough rim, but does have some usage and cleaning marks. Two are available. I need your zip code to calculate the postage. 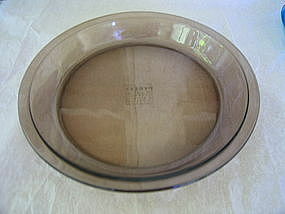 14 ounce bowl Pyrex marked as 39. It is pre-microwave production. 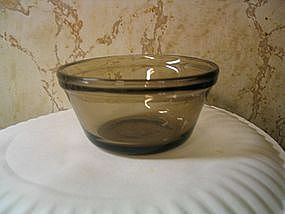 It is the very thin glass that Pyrex used for several years. No chips, cracks or breaks. Very little sign of use. 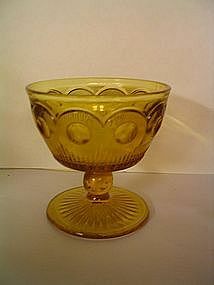 The smaller custard cups are more common in this style. I need your zip code to calculate the postage. 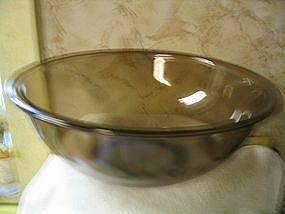 It is the largest size (4L) of a nesting set It is the 4L mixing bowl. A few light utensil marks. Other sizes of the set are available for purchase and priced individually. I need your zip code to calculate the postage. 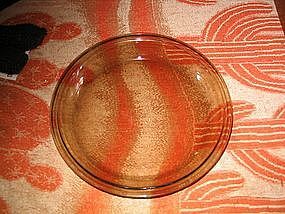 9" amber pie pan marked with 209. I am not sure of the date of manufacture, although it is not marked microwave safe. There are no chips, cracks or breaks. Light utensil wear. I have 2 pans available for sale and are priced individually. I need your zip code to calculate the postage. I've seen conflicting manufacturer and pattern names for this particular dish. 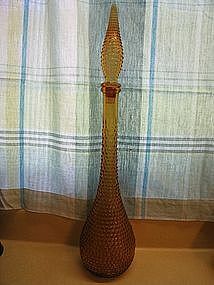 It is approximately 3 3/4 inches in height and 3 3/4 inches across the top. No chips, cracks or breaks, but there is a rough spot on the mold line at the base. I will be happy to provide additional photos. I need your zip code to calculate the postage.